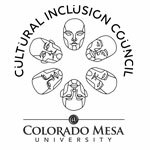 Cultural Inclusion Council | Colorado Mesa Univ. The Cultural Inclusion Council (CIC) strives to promote equity and inclusion on campus and in the surrounding community by hosting educational and promotional events, connecting students to support services and promoting open dialogue that allows individuals to better understand one another. To join any of the alliances affiliated with Cultural Inclusion Council, stop by their offices on the second floor of the University Center in Student Life. You don't have to be of a particular ethnicity to join an alliance — anyone is accepted and welcomed in any alliance. You can check out their pages on OrgSync by clicking here.